We present tf-encrypted, a library for doing secure computation directly in TensorFlow. We highlight the goals and motivations of the project, as well as the advantages of building cryptographic primitives into TensorFlow, all demonstrated with benchmarks and code snippets of our initial secure multi-party computation protocol. This work was presented as a contributed talk at the Privacy-Preserving Machine Learning workshop during NeurIPS 2018. 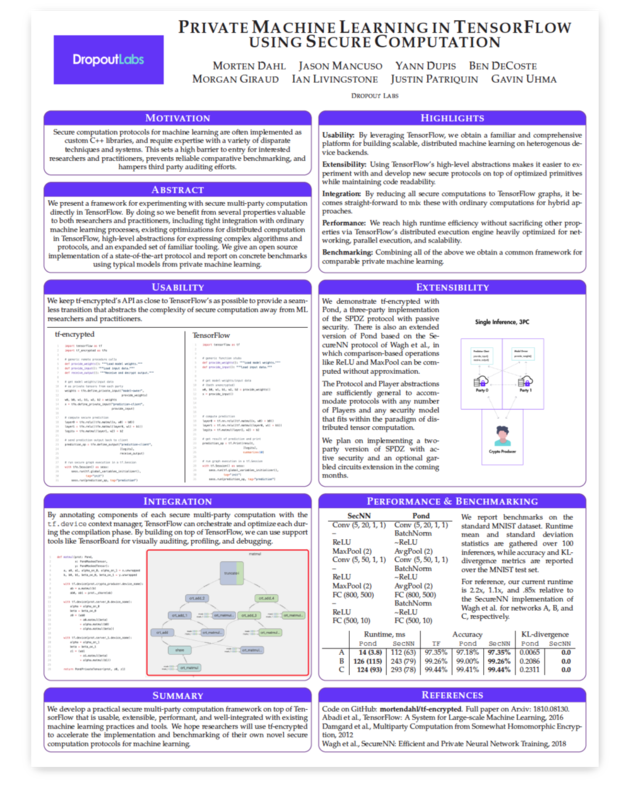 A poster presented in tandem with the above preprint at the NeurIPS Privacy-Preserving Machine Learning workshop. Benchmark numbers have been updated since posting the preprint to Arxiv.